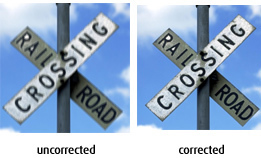 Astigmatism can come in combination with short-sightedness and long-sightedness. Because of its asymmetrical curvature, the astigmatic eye focuses light correctly along one axis, but incorrectly along the other. Light entering the eye is not focused on a single point on the retina, so objects both near and far become blurred or distorted producing an effect similar to looking through a pane of wavy glass.